We all know that fidget spinners are all the rage but most of them just all look the same and that is kinda boring. But this fidget spinner is different in shape and color making it just the one you deserve. 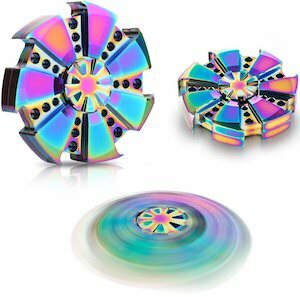 The fidget spinner is called flower shaped and it sure looks amazing and the strange colors on it make it even better because that will look amazing when you spin it. And spinning it will thanks to the high-quality ceramic bearings this spinner moves super smooth and that makes me wonder how long you can make it spin. A toy like this is great for people with ADHD, ADD, Autism, and everyone else that wants to get their mind off things and maybe even improve hand strength. Come and have a much closer look at this Flower Shaped Fidget Spinner.